For your next coffee table set, think white and bright! The Amelia 3 Piece Table Set from American Freight Furniture and Mattress is a fabulous addition to any living room design. The two-toned country chic table set is white and chestnut. The top has a natural wood finish and the base is all white wood. But don’t let the white furniture intimidate you! This simple style is on-trend and easy to incorporate with nearly any living room theme. The coffee table comes with two matching side tables that are perfect to place next to a sectional or in-between a sofa and loveseat combo. We love the two-tiered detailing on each table. Use the extra surface space to stack books or stage decorations. Is your living room dark? An easy way to make it appear brighter is to add light accent furniture. The Amelia 3 Piece Table Set has a simple white frame and base that allows light to travel throughout the room. However, the rich tabletop ties in nicely with dark sofas or living room decor. We recommend placing the side tables and coffee table near the darkest decor in the room for contrast. One of the highlights of this set is it looks great with dark and light furniture themes. Paint your walls an off-white color like eggshell or cream. 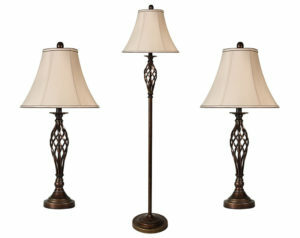 Add floor lamps in the corners to brighten the space. Place a light gray, cream, or white rug over your dark flooring. For more living room lighting inspiration, click here. As soon as you see the Amelia in person, you won’t be able to keep your eyes off it. Here are five reasons you’re going to want to take it home today with low easy payments. One of our favorite parts of the Amelia table set is the simple yet elevated design. The tops of all three tables are slightly broader than the frame to give you plenty of surface space to work with. The base of the framework is wide and gradually becomes narrower towards the top of the table. Each of the three tables features a second tier of shelving beneath the tabletop. This simple design element lets you display more decorations in your living room without overcrowding every surface. The all-wood build of the Amelia 3 Piece Table Set is a crowd pleaser. Each table has a lightweight frame that’s easy to move around any room. However, the tables are also very durable. You can place heavy ceramics or lamps on the tables without any worry. 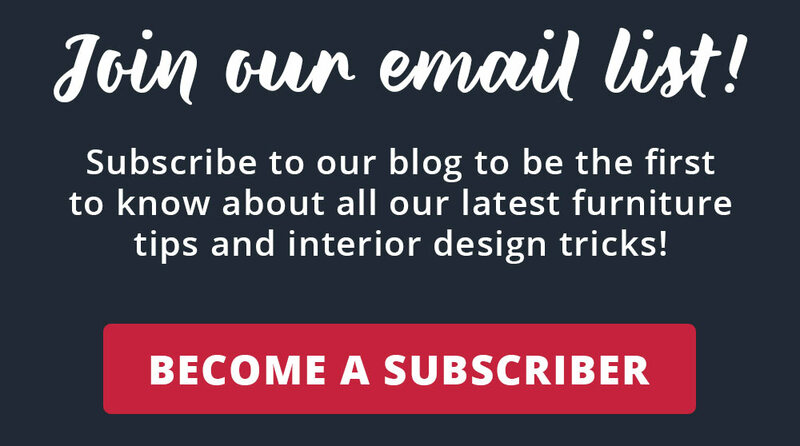 For more information about the materials, visit your local American Freight Furniture and Mattress. 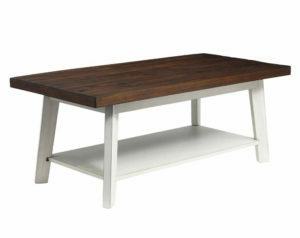 Chestnut and white are a match made in heaven in this coffee table and side table set. The two tones make it super easy to pair with a variety of accent chairs, sofas, recliners, and sectionals. Plus, if you switch up your design from a dark theme to light or vice versa, the Amelia 3 Piece Table Set will still match the look you’re going for! You won’t regret investing in a versatile collection like this. For more wood and white design inspiration, click here. The symmetry of the side tables is pleasing to the eye. You’ll have no issue tucking them next to a loveseat or accent chair for a balanced living room design. Create a cohesive design throughout your home by adding the Amelia 5 Piece Dining Set or Amelia 5 Piece Pub Height Dining Set to your kitchen or dining room. If you have an open concept kitchen and living space, these sets can help you tie everything together. 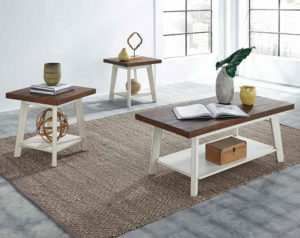 Best of all, you can take home the coffee table and side table set for only $298. Add on either dining set for only $398. That means you can complete your living and dining table sets for less than $700! Try the Amelia 3 Piece Table Set before you buy it by stopping into your local American Freight Furniture and Mattress. 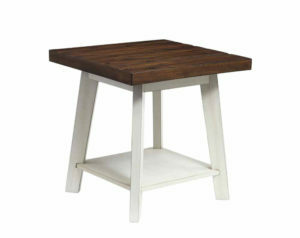 We have a variety of coffee tables and side tables as well as the Amelia dining and pub height table sets. Click here to find a store nearest you.